We do 4-color cup printings and black shaft printings. Example, you can print your company logo to the cup and put your slogan or web address to the shaft. Just add your texts / image to their proper fields when making your order. What kind of pictures can I use for cup printing? We can work with all major picture formats example .jpeg .bmp .png .ai etc. Only limitation is size of the cup. It is 1,2 cm, so keep that in mind when planning your new masterpiece. Also we want to emphasize copyrights. You need to have a license to use your desired image. The customer is responsible of all supplied materials (logos, texts, etc.) for printing. Can I choose different font for shaft prints? Shaft printing is done by arial or micro depending which works better with your messages. If you need it with some other font, don’t hesitate to ask offer for logos to the shaft. Biogolftee is made out of wheat- and cornstarch. It is 100% biodegradable. Biogolftees are very strong, it’s possible to play multiple rounds with one tee. Biogolftee bends rather than breaks. Can I play with it on any golf course? Yes you can. 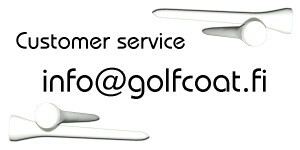 Biogolftee is golf club, machine and nature friendly. How fast will I get my Biogolftees? After receiving payment, production takes 2 days and delivery 2-6 days depending on your location.